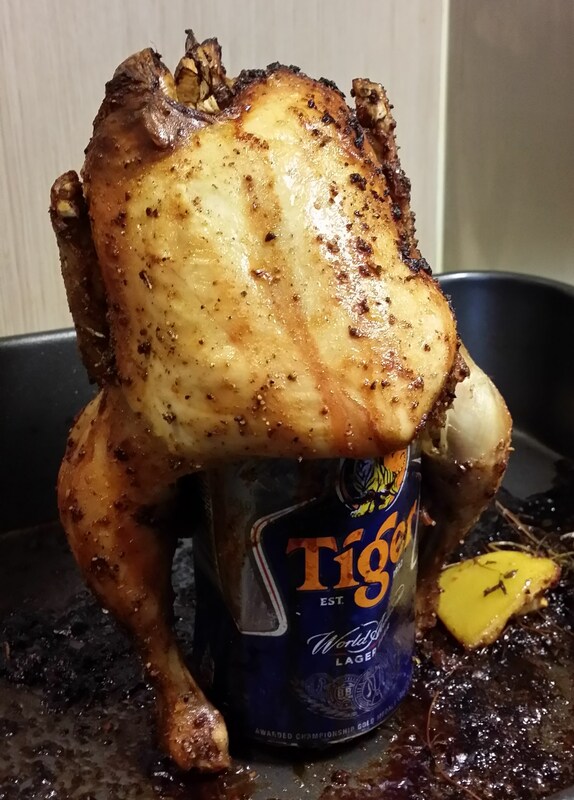 I know this sounds like a gimmick, but trust me once you’ve tried beer can, you won’t want to roast your chicken any other way. The first time we tried this dish, we were in Batam, Indonesia. To be honest, we were very disappointed. The meat was dry and tasteless. We couldn’t understand what the fuss was all about. But I thought I’d try making it at home. The results were worlds apart. I think the restaurant in Batam was simply baking the chicken and stuffing an empty can of beer up it’s-you-know-where before serving up the chook. That’s useless. You need the beer in there throughout the cooking process. The beer will evaporate and keep the chicken moist while adding lots of flavour. Heat oven to 200 degrees. In a spice or coffee grinder, powder together the fennel seeds, chili flakes, peppercorns, salt and steak rub. Mix with olive oil and rub all over the chicken. Make sure you get the insides as well. Stuff the chicken with the garlic cloves, herbs and lemon. Really stuff it in there, you need room for the beer can. Open the beer can, take a couple of good swigs. You don’t want it full. Place the chicken over the beer can, place the whole thing on a baking tray. Roast in the oven for 1 and a half hours. The beauty of this recipe is that the chicken doesn’t dry out, so you don’t have to turn it, you don’t have to do anything really. Just keep an eye that the chicken doesn’t topple over. The beer starts to bubble and that can push the chicken off. If the chicken falls off, it’s not a big deal, just carefully stuff it back on – happened to us a couple of times – it’s quite funny to see. It looks like the chicken got drunk and fell over! After an hour and a half, switch off the oven, allow chicken to rest for a few minutes. Carve up, or if you’re impatient like Mangy, just pull apart using your fingers. Don’t throw away the garlic, slow roasted garlic is a real treat – Enjoy!